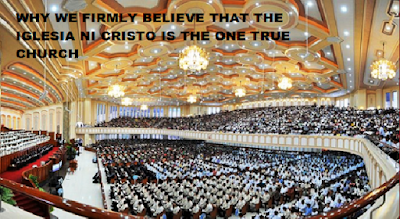 THE IGLESIA NI CRISTO: Why Iglesia Ni Cristo (Church Of Christ) is the one true Church? 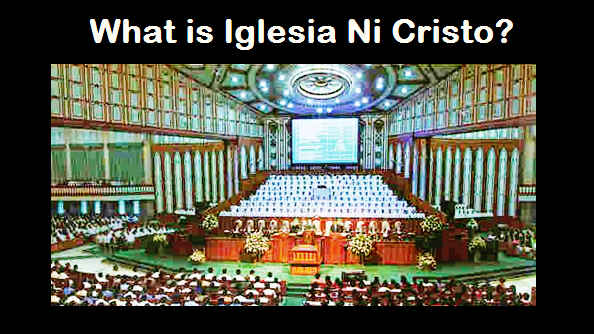 Why Iglesia Ni Cristo (Church Of Christ) is the one true Church? We should not be surprised that these people made up their own “standards” or “identifying marks” because Apostle Paul already warned us that “...They have not known the way in which God puts people right with himself, and instead, they have tried to set up their own way; and so they did not submit themselves to God's way of putting people right.” This is how many people are deceived by false churches. They made up their own “identifying marks” of the one true Church and professed that these can be found in their own body. “WHY ARE WE CERTAIN THAT THE BIBLE IS THE WORD OF GOD? Thus, the only way to find the one true Church is to use the Bible as our basis. Submit ourselves to the words of God written in the Holy Scriptures. However, let us first find out if the Bible truly teaches that there is only one true Church. The Lord Jesus Christ said, “I will build My church.” he did not said, “I will build My churches.” The Lord Jesus Christ established only one Church. Take note that the Lord Jesus Christ is the founder and owner of the one true Church. Apostle Paul explicitly said, “There is one body,” The Church is the body of Christ, thus there is only one true Church. IS THE CATHOLIC CHURCH THE ONE TRUE CHURCH BUILT BY CHRIST? The Roman Catholic Church claims that they are the one true Church built by the Lord Jesus Christ. However, let us compare the one true Church built by Christ with the Roman Catholic Church. The Bible said, “there is no other name under heaven given among men by which we must be saved.” The verse further testified, “Nor is there salvation in any other. Thus, if a church is not called “Church of Christ” it means that there is no salvation in this church. The Church is the body of Christ. There are other verses of the Bible that clearly pronounced that Christ is the head of the Church. Thus, it is a biblical fact that the Lord Jesus Christ is the head of the Church which is His body. WHERE IS THE CHURCH FOUNDED BY CHRIST IN THE FIRST CENTURY? Thus, our question is already answered. Where is the Church founded by Christ in the first century? It was apostatized. Thus, after the death of the apostles, among the bishops of the Church will rise those that will distort the truth. Apostle Paul explicitly warned us that those that will follow or succeed them (after their death) will distort the truth. Who is claiming “apostolicity” or that their origin can be traced back to the apostles? Who is claiming to be the successors of the Apostles? We all know the answer to these questions. When the Church of Christ of the first century departed from the true faith and followed the erroneous teachings (teachings not taught by the Lord Jesus and His apostles, and teachings not written in the Bible) like clerical celibacy and abstaining from meat, she became the Catholic Church. This is the reason why the Catholic Church is the one that continued up to this day. Thus, the “apostolicity” (that they are the successors of the apostles and who continued for 2,000 years) is not a mark of the one true Church, but the mark of the apostate church. The apostles warned us that those who will follow them after their death are those that will distort the truth. “Another parable He put forth to them, saying: ‘The kingdom of heaven is like a man who sowed good seed in his field; but while men slept, his enemy came and sowed tares among the wheat and went his way. The “kingdom of heaven” mentioned in this parable of the Lord Jesus is the one true Church (cf. Luke 12:32; Acts 20:28) which is likened to “a man who sowed good seed in his field.” The sower of the good is the Lord Jesus Christ (cf. Matt. 13:37). However, those churches not of Christ are likened to “tares” sowed by the “enemy” (the devil). Is there salvation in these various churches which are not the Church of Christ? What are the identifying marks of the one true Church according to the Bible? How can we identify the one true Church among the numerous churches today? However, there are other organizations also calling themselves “Church of Christ”? As we said, called by the name “Church of Christ” is only one of the identifying marks of the one true Church. If not called “Church of Christ” we must immediately dismiss them as the one true Church, but not because they call themselves as “Church of Christ” they are automatically the “one true Church.” The Bible gave us other identifying marks of the one true Church or the true “Church of Christ.” The Church who says that they are the one true Church must not only be called “Church of Christ” but that the other identifying marks the Bible gave must also be found in them. Thus, the true Church Of Christ based all their doctrines in the teachings written in the Bible. The one true Church today doesn’t go beyond what is written. For the Iglesia Ni Cristo (Church Of Christ), the Bible is the sole basis of our teachings and practices. All the doctrines and practices of the Church Of Christ are based on the teachings written in the Bible. THE IGLESIA NI CRISTO DOCTRINES"
“Ye are my witnesses, saith the LORD, and my servant whom I have chosen: that ye may know and believe me, and understand that I am he: before me there was no God formed, neither shall there be after me. ONLY TRUE GOD AND NO ONE ELSE BESIDES HIM"
The Lord Jesus Christ also tells us that we must know (accept, recognize) Him as the one SENT by the one true God. Thus, the truth the Bible teaches and the one true Church upholds is that the Father alone is the one true God, and Jesus Christ is the Son of God whom He has sent, the mediator between one true God and men. "THE IGLESIA NI CRISTO BELIEVES IN THE LORD JESUS CHRIST"
We firmly believe that the establishment of the Iglesia Ni Cristo (Church Of Christ) that emerged on July 27, 1914 in the Philippines is the fulfillment of the biblical prophecies regarding God’s “Holy People” from the ends of the earth. Hence, the Iglesia Ni Cristo (Church of Christ) as God’s chosen people in these last days is confirmed by biblical prophecy. “IS THERE SUCH A THING AS GOD’S CHOSEN PEOPLE? The Lord Jesus Christ knew that apostasy will take place at the first century Church Of Christ. He Himself made pronouncement about this (cf. Matt. 24:9-11). Because of this, the Lord Jesus Christ also prophesied the re-emergence of His Church. He promised to re-establish the Church Of Christ. Because apostasy will take place at the first century Church Of Christ, the Lord Jesus promised that He has “other sheep” not of the fold already established in the first century (the first century Church Of Christ). He will bring them also and form them as one flock (Church Of Christ). Hence, when the Lord Jesus Christ said that “…other sheep I have which are not of this fold; them also I must bring, and they will hear My voice; and there will be one flock and one shepherd” He is referring to His re-establishment of the Church Of Christ. This is the reason why the Iglesia Ni Cristo (Church Of Christ) emerged only in 1914. The Church the Lord Jesus Christ built in the first century was apostatized. However, the Lord Jesus Christ made a promised of re-establishing His Church that He called His “other sheep.” The “Other Sheep” are also the “children of God” from the ends of the earth, from the Far East. WE didn’t invent these “identifying marks” we presented here, but these are the marks given by the Holy Scriptures (or the Bible). “And this is eternal life, that they may know You, the only true God, and Jesus Christ whom You have sent. “You are My witnesses," says the LORD, "And My servant whom I have chosen, That you may know and believe Me, And understand that I am He. Before Me there was no God formed, Nor shall there be after Me. (4) Elected by God and recognized as God’s Chosen People in these Last Days.” The Iglesia Ni Cristo (Church Of Christ) is the fulfillment of the prophecy regarding God’s “Holy People” from the “ends of the earth.” Thus, her being elected or chosen as God’s nation or people is not just a mere claim, but confirmed by biblical prophecies. (5) Founded by Christ through prophecy. The Iglesia Ni Cristo (Church Of Christ) is the fulfillment of the prophecy regarding Christ’s other sheep (cf. John 10:16), of Apostle Peter’s prophecy regarding those from “afar off” (cf. Acts 2:39), and of Prophet Isaiah’s prophecy regarding the sons and daughters of God that will emerge from the Far East, from the ends of the earth (cf. Isaiah 43:5-6 and Moffatt). Therefore, the Iglesia Ni Cristo (Church Of Christ) as the one true Church in these last days is confirmed by biblical prophecies. The prophecies written in the Bible that were fulfilled in the Iglesia Ni Cristo (Church Of Christ) are our testimonies that this is indeed the one true Church today. All are welcome to attend our congregational worship services, Evangelical Missions, and Bible Studies.